When I’m creating new layouts, I routinely use Photoshop and then often need to separate out individual elements to use in my designs. Normally I create a new document and then either cut and paste the layer, or drag the layer to my new document. Today I’ve discovered something even greater than that and it’s super easy to do. First turn off all the layers that you do not want to export to a new file (unless of course you want to export all of them). 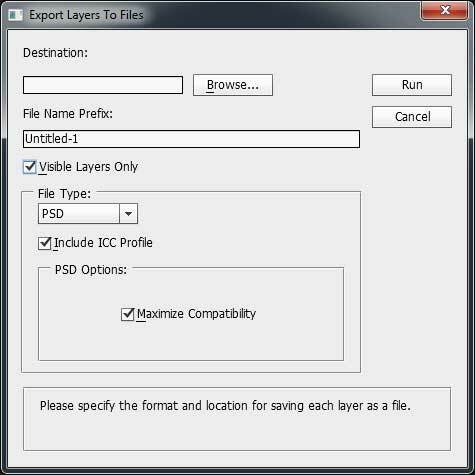 Next go to File > Scripts > Export Layers to Files. Ensure you check the box for Visible Layers Only. Click Run and VOILA! New Files! Now maybe I’m a little late to the party, but I thought this was an amazing and simple find, wanted to share it with you all.